Sept. 20, 2011 - PRLog -- MIAMI – Melanie Wolff, a senior at Ronald Reagan Doral Senior High School, has been featured in the National Honor Society’s (NHS) magazine for her role in launching a national ovarian cancer awareness campaign. Leadership for Student Activities is a monthly magazine for advisers who work with student councils or Honor Society chapters. Each month during the school year, Leadership focuses on a topic of interest to student leaders and their advisers in student activities at the middle level and high school. The magazine’s circulation reaches every member of NHS’s 23,000 chapters in all 50 states and 40 countries overseas. In the September issue, the magazine focused on 17-year-old Wolff who is president of Reagan/Doral’s Honor Society. After Wolff’s mother, Marli, was diagnosed with stage IV ovarian cancer in April 2009, Melanie and her family started a foundation named after her mother to bring awareness about the importance of early detection. Medical experts often refer to ovarian cancer as a “silent killer” because once the symptoms become evident the disease has advanced to the most dangerous levels. According to the American Cancer Society, Ovarian Cancer is the deadliest gynecologic cancer and the fifth leading cause of death in women in the United States with 22,000 women diagnosed annually. Experts report that 80% of them are diagnosed at stage III or IV. The five-year survivability for this disease when diagnosed at these stages is approximately 15%. When diagnosed in earlier stages (I or II), the five-year survivability increases to 90%. Wolff helped create Miles for Marli, a fundraising event that can be held in any city to help raise awareness of ovarian cancer. It is a relay walk, consisting of different teams or individuals competing to see who will raise the most money. For every dollar the teams collect for Message for Marli, Inc., a person from each team will walk a lap around the track until another teammate replaces them. Every student participating will receive community service hours. This fall, Wolff will help launch fundraisers for marathon runners. The funds donated to MFM are used to create a variety of informational resources regarding ovarian cancer thus extending Message from Marli’s global campaign. The literature produced is used to supply medical organizations with valuable information for patients, families, and caregivers at institutions such as the University of Miami Sylvester Comprehensive Cancer Center. For more information, visit www.messagefrommarli.org. To view the National Honor Society article, please visit: https://files.me.com/cjonespr/e92qtl. 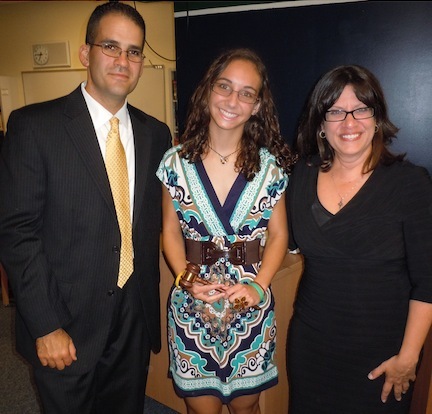 Photo caption: Ronald Reagan/Doral Senior High School Principal Jacques Y. Bentolilla, Melanie Wolff and NHS Chapter Leader/English teacher Elsa Almaguer at Wolff’s induction ceremony (Photo courtesy Message From Marli Foundation). With offices in South Florida and Washington, D.C., CJ&A PR specializes in Corporate and Crisis Communications; Legal and Professional Services Marketing; Multicultural Marketing; Entertainment Publicity; Event Planning; and Communications Training.